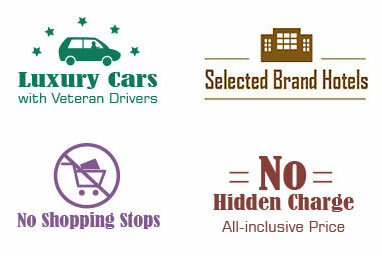 Our guide will greet you outside the customs of the Capital Airport and then transfer you to check in the hotel. The rest of the day is free at your own leisure. 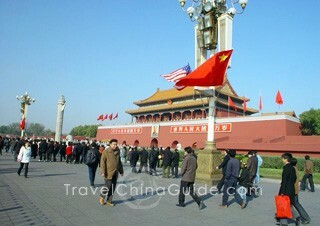 In the morning, drive to the heart of the city to visit the large Tiananmen Square and then walk northward to the Forbidden City. Constructed in the early 15th century, the Forbidden City is the largest and best-preserved imperial palace complex in the world. As is our practice to avoid the poor food at the cheap tourist eateries, we will serve you an a la carte lunch (valued at CNY150.00 per person and included in our price) at a nice local restaurant, where you can taste the authentic Chinese food. The following Temple of Heaven has the grandest prayer hall and holy altar, where the ancient emperors offered sacrifices to the heaven. .
Today you are going to take an excursion to the Mutianyu Great Wall in suburban. Some necessary hiking are required to reach the peak to overlook this world largest man-made project. We will arrange the round trip cable car for you to keep energetic for the later journey. We do not offer lunch today. On the way back to downtown, you will have a stop at the Bird's Nest, the permanent site of 2008 Olympics, and take some pictures. 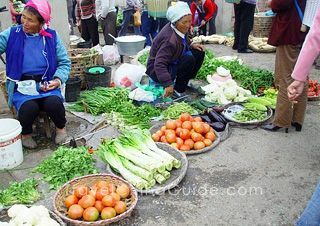 Then we will drive you to a local market for a short visit before going back to your hotel. You will go to visit an outstanding royal buildings this morning. One is the Summer Palace which was a luxury resort of the royal family for over one century. At present, a great many travelers are attracted to visit the largest royal park, consisting of classical buildings, large manmade Kunming Lake and hills as well as delicate natural scenery. Then, take a Hutong excursion to see the most local life and residences in the zigzag old alleys, which still keep the original appearance of hundreds of years ago. Lunch is not included today. 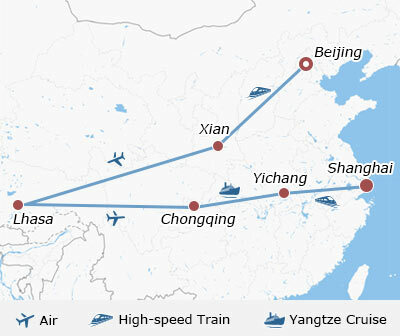 You will take a high speed train to Xian. Our local guide will meet you at the railway station and transfer you to check in the hotel. 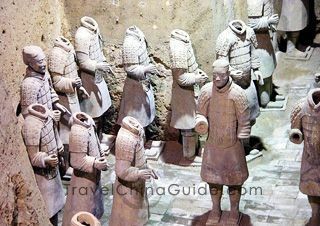 Your private sightseeing to the ancient capital will be started from the Terracotta Warriors and Horses Museum this morning. Praised as the Eighth World Wonder, thousands of life-like terracotta figures of 2,200 years ago are exhibited there to show the powerfulness of the country at that time. Lunch is on your own arrangement. In the afternoon, you are going to see the Big Wild Goose Pagoda of 1,300 years ago. Originally built to store rare Buddhist sutras from Indian, this pagoda has been one of the landmarks of Xian City. The following Shaanxi History Museum has much more rare collections through the long history. Climb up the ancient City Wall of Xian this morning. On the base of the capital's defensive wall of the Tang Dynasty, the present City Wall was reconstructed in the Ming Dynasty of 600 years ago. The 13.7-kilometer's long wall is flat on the top, where you could have a bird's view of Xian on foot or by bicycle if time permits. A home cooked a la carte lunch (valued at CNY120.00 per person and included in our price) will be served while you visit a local family today. If interested, you could learn some cooking skills there with the friendly hostess by attending our Chinese food cooking class. In the afternoon, you will proceed to the quiet Great Mosque surrounded by bustling Moslem bazaar. As the trip ends, it is suggested that you explore the bazaar where the popular local dim sum, souvenirs and gadgets are sold. You will leave for your next destination by air today. The flight will take you about 3 hours to arrive at Lhasa Airport, which is located 3,650 meters above sea level. Our guide will welcome you and then transfer you to the hotel in downtown district. During the remainder of the day, it is suggested that you rest at the hotel to adapt to the high altitude. In the morning, a brief visit to Tibet Museum will be helpful to get to know this region's long history, brilliant culture and Tibetan Buddhism. In the afternoon, you will visit the Sera Monastery and the Norbulingka Park. 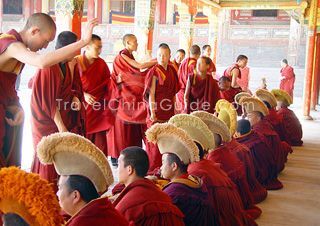 As one of the three greatest monasteries in Tibet, the Sera Monastery is noted for the daily debating of Buddhist doctrines among lamas and the annual Buddha-unfolding in Shoton Festival. Turn to the Norbulingka Park, there are nice garden and buildings which once was the summer palace of Dalai Lama. You will take wondful day sightseeing to the Potala Palace, the Jokhang Temple, the Barkhor Street and then finish the visit at a Nunnery. Located on the Red Hill, the splendid Potala Palace has been the landmark of the Lhasa for hundreds of years. 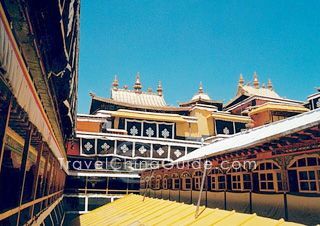 Rather than the political and religious center of the city, it is also the largest treasure house of Tibetan culture. The following Jokhang Temple is located in the center of old city which is also the spiritual center of Tibetans. As the first Buddhist building in Tibet, it has a sovereign position in Tibetan Buddhism where the life-size statue of Sakyamuni is set. Surrounding the temple, there is the Barkhor Street where you could find ancient Tibetan style buildings and featured stores as many as possible. You will get to Chongqing by air today. 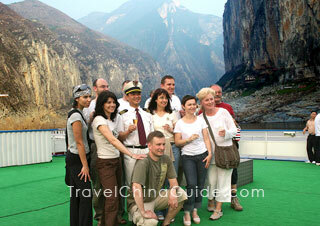 Our guide will be waiting for you at Chongqing Airport and transfer you to board on the well-sound Cruise ship. If time permits, you could drop in at the Panda House of Chongqing Zoo to see the adorable giant pandas. After breakfast, the river guide will give a brief introduction of the cruise and the daily schedule. Then you will take an onshore excursion in Zhongxian to visit Shibaozhai, which is famous for its fanciful architecture and many interesting legends. With the reputation of 'Pearl on the River', Shibaozhai has received 220,000 visitors from home and abroad every year since opened to the public in 1979. Now it has become the 'little Penglai' for tourists to overlook the views of Yangtze River. Or, you will land on the Ming Mountain to visit the Ghost City. As the name implied, visitors could get to know Chinese ghost legends from various kinds of statues and buildings in ghostdom. While returning to the ship, you may have some leisure time strolling on the deck to enjoy the scenery along the river and please prepare to attend the Captain's Welcome Party tonight. Today you will see the most astonishing cliffs and sceneries on the two banks of the river while the ship is sailing through the well-know Three Gorges. The first Qutang Gorge is the shortest but the most impressive of the three. The next Wu Gorge is famous for its lofty peaks and mountains on both sides. Before entering into the final Xiling Gorge, you will experience an interesting junk adventure along the Shennong Stream or Three Little Gorges. While enjoying the grotesque cliffs and clear water in the narrow stream, you could also hear the singing of those local boat trackers, all of whom are Tujia minority people. 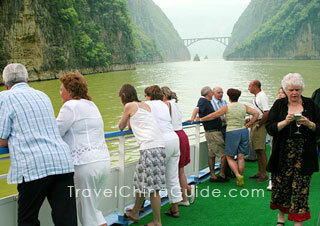 After the excursion, the ship will set out to the longest Xiling Gorge. This morning, you will check out the ship and disembark to visit the Three Gorges Dam. You will take a bus up to the peak of Tanziling and get a bird's eye view of the grand Three Gorges Dam Project. Then you will be transported to the Three Gorges Tourist Center in Yichang city. Our local guide will meet you there and transfer you to take a bullet train to Shanghai with a duration of around 7.5 hours. 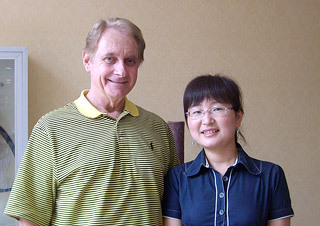 Our local guide in Shanghai will be waiting for you at the train station and transfer you to the hotel. In the morning, you are going to see the extensive historical collections in Shanghai Museum. Besides those delicate artistic items, the unique ethnic minorities' culture exhibition is also recommended. After that, you could wander in the quiet Yuyuan Garden, which is a typical and classical building complex in southeast region. An a la carte farewell lunch (valued at CNY150.00 per person and included in our price) will be served for you at a fancy and famous local restaurant, which offers veritabe local dishes. In the afternoon, a Huangpu River Cruise will take you to view the centuries-old and modern files of this international metropolis. 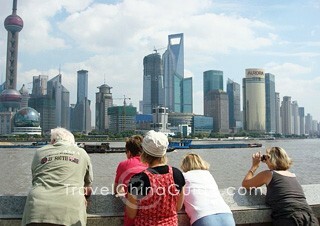 After disembarking, explore the Bund Area and then visit an old street of the city. Our guide will meet you in the hotel lobby and transfer you to the airport today. Already having a memorable private China tour, we wish you a pleasant homebound journey, too! Prices are per person in US Dollars based on double occupancy. The prices in red reflect the current discount. Any parts of the itinerary e.g. tour length, activities & hotels can be tailored to your individual interests. Had a question about food. What type of food will be available during the tour? The daily breakfast is served at the hotel or cruise ship in buffet style with Chinese and Western food. While for lunches included in the tour, they are Chinese dishes in nice local restaurants. Hi, for the flights we will take on the tour, I am assuming we do not need the e-ticket, we just turn up at the airport and show our passports and the get boarding passes there, right? In regard to the air tickets for internal flights, we issue the E-ticktets which do not need to be taken at the airport. You can show your passport copies at the designated check-in counter to exchange the boarding passes. If you take the tour with us, our guide will help you to board the flight smoothly. Thank you. Can all TICKETS of the four categories ships i.e the star-rated ship, the foreign tourist ship, the domestic tourist ship, and the common passenger ship be BOUGHT on the spot instead of going through an agent for booking? You can purchase the cruise tickets at the pier, but it is suggested that you book the tickets in advance through a local agent or from the cruise directly. when is the shoulder season? For ship journey, generally, April, May, September and October belong to high season and the rest of the months belong to shoulder season. The best time are April,May,Sep.and Oct.